Q: How will I get my Pokemon, how does this work? A: We will perform an online trade in-game. You’d send me junk Pokemon in exchange for Pokemon that you’ve bought. If you’re new to online trading or not sure how to do so, do visit the Trade Guide. A: Orders are prepared in batches, approximately 4 times a day. This means that your order is not (usually) immediately worked on once you place it, even if I’m online. You are advised to place your order and wait for the email notification that your order is ready to avoid delays. Batches preparation begins when enough orders come in and emails are sent when the order is ready. 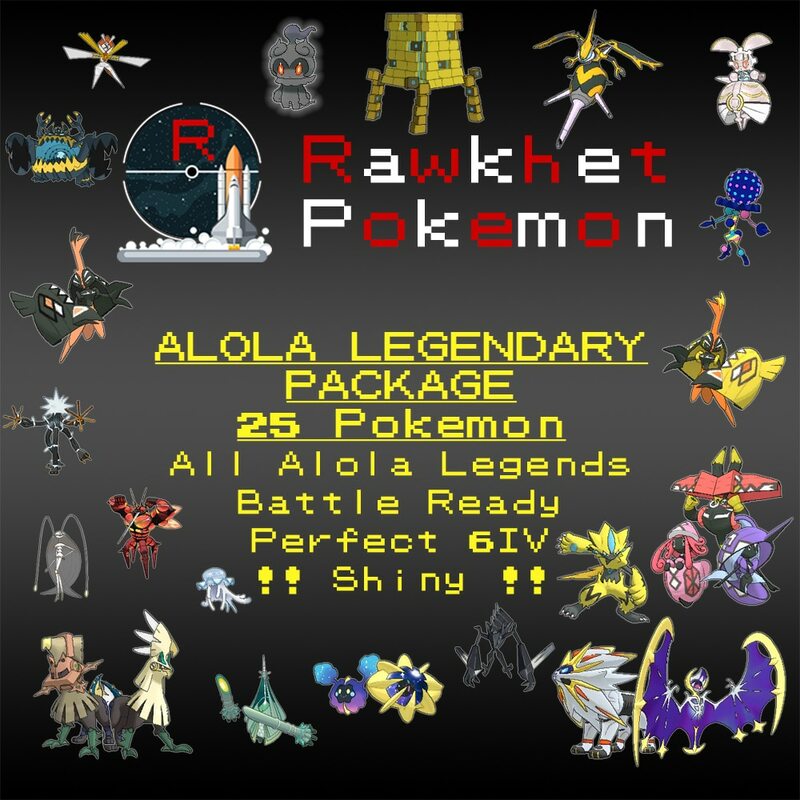 This also means that bigger orders – such as the Legendaries or Mega Evolution Package – are prepared faster. Small orders – such as ordering a single Custom Pokemon – will wait for other orders to be prepared alongside it. Complex Custom orders NOT using Showdown Mode will only be processed ONCE a day. Orders with errors (e.g. requesting illegal moves on Custom Pokemon) will be prepared last. A: You can find a full list of listings on the Shop main page. If you can’t find something you want, you can purchase it under Custom Pokemon. Q: What games do you support? A: All Gen 6 (XY, ORAS) and Gen 7 (Sun & Moon, Ultra Sun & Ultra Moon, Let’s Go Pikachu & Eevee) games. All listings will state which games they are for in the title and description. Q: When do I gain the ability to trade in-game? A: In Gen 6, the Player Search System (PSS) is unlocked by the time you complete the first Gym. In Gen 7 (3DS), the Festival Plaza is unlocked by the time you visit the Trainer School in Hau’oli City. In Gen 7 (Switch), you get access almost immediately via the Communicate function in the menu. Q: Can I get banned? A: Nope. Has never happened, and will never happen. Q: How do I order a Pokemon? 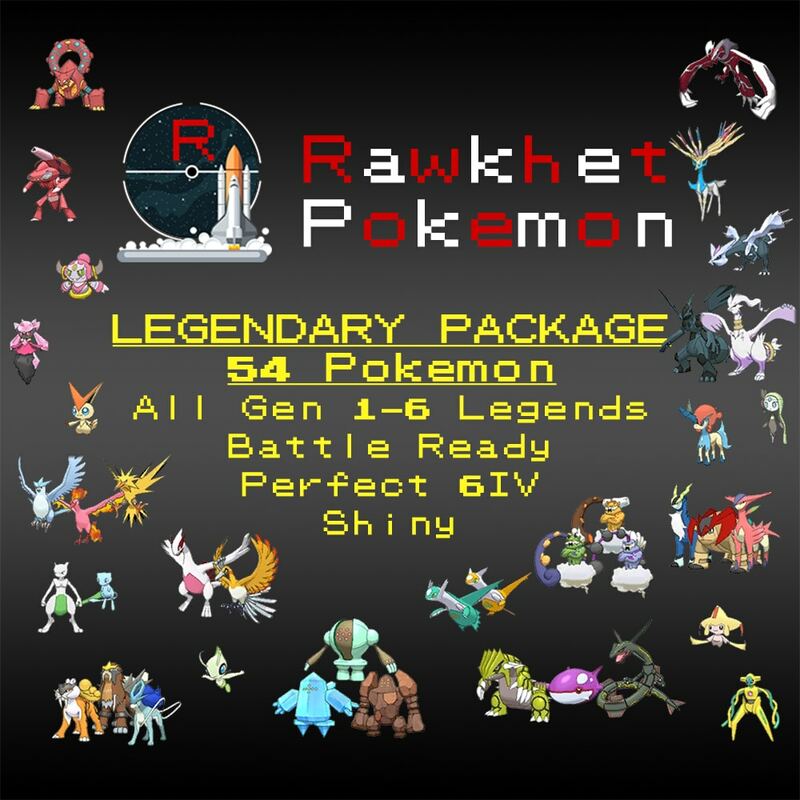 A: Visit the Shop page and add the Pokemon listings you want to the Cart. Write any details about your order in the Order Details section at Checkout. You can then Checkout your purchase through PayPal, Apple Pay, or Chrome Payments. PayPal and Stripe both accept essentially every kind of Credit and Debit Card, and neither require you to make an account with them. Other payment methods like Cash are not supported. When your order is submitted, you will receive an email receipt of your order and I will contact you within 12 hours (usually a lot less, 15 mins if you’re managed to catch me during preparation to 6 hours) to arrange collection. You can also get in touch via the website’s online chat or even Facebook Messenger at this link should you prefer that over email. Many other ways (Twitter, Skype, Telegram) to contact me are listed under the Contact page. I am human though, with a full-time job – please understand if I am unable to reply for an extended period of time (never above 12 hours). Q: Is payment on this site secure? A: Your payment is handled by PayPal and Stripe, and not by me or this site. I have no visibility over your payment and am simply told by the payment processor when your transaction goes through. That being said, if your card or transaction is declined, you may want to check with your bank as I won’t be able to assist. Additionally, this entire site is secured by SSL. 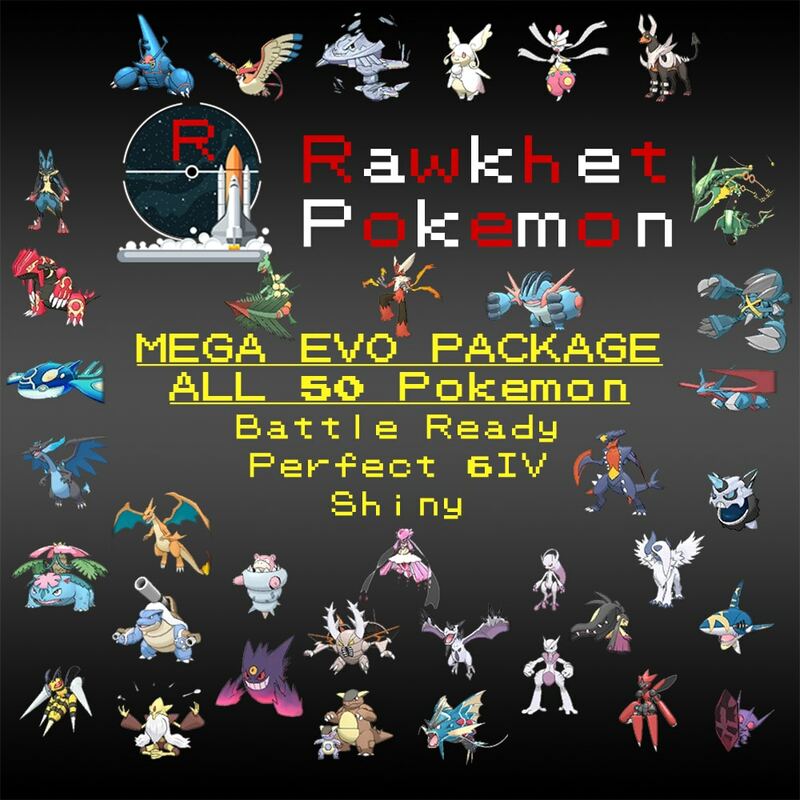 Q: Are the Pokemon Legal, and can I use these Pokemon online (trades, battle, Pokemon Bank)? A: Definitely. All the Pokemon on this site (including Custom Pokemon) are legal. Generally, illegal/hacked Pokemon cannot be traded and I wouldn’t be able to send them to you. Legal Pokemon can be used for online battle, Battle Spot, and be placed in Pokemon Bank. Any in-game limitations or restrictions placed on some battles (e.g. no legendaries allowed) still apply. Q: What Pokemon cannot be Shiny? A: Victini, Keldeo, Meloetta, Hoopa, Volcanion, Tapu Fini, Cosmog, Cosmoem, Solgaleo, Lunala, Necrozma, Marshadow, and Zeraora cannot be Shiny. If someone offers or trades you one, take note that it’s hacked. Sometimes, hackers send such Pokemon through the GTS. In LGPE, Mew cannot be Shiny. Q: I just started my game, will traded Pokemon obey me? A: Traded Pokemon will obey you if you have enough Badges (Gen 6 & LGPE) or Stamps (Gen 7). It is recommended that you progress further into the game if you want higher level Pokemon. You can read more about Obedience at this article. Complex Custom orders NOT using Showdown Mode will only be processed ONCE a day. 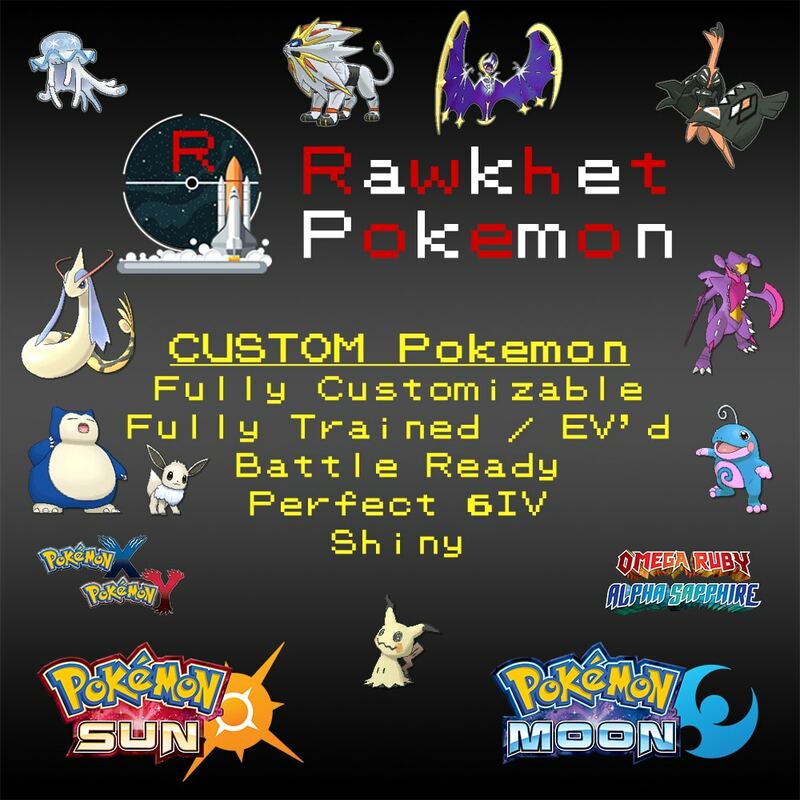 You can purchase Custom Pokemon here! Q: What can you customize in a Pokemon? A: I can customize the Pokemon within the legal boundaries of the game, that is, it must be able to exist in the game. For example, I can get you a Max IV, Level 100, specific natured, nicknamed Solgaleo with your trainer name, but I cannot make it shiny because Solgaleo cannot be shiny. I also cannot give Pokemon moves that they cannot learn. Characteristics is also not (usually) supported – it is too niche and difficult (and is purely cosmetic). Nicknames are a max length of 12 characters. Q: Can I have my ID on the Pokemon? A: If you want your ID on the Pokemon for cosmetic reasons, just write your Trainer Details at Checkout under Order Details or send it to me. If you have a functional reason for having your ID (e.g. obedience, name rater), you’ll have to send over a reference Pokemon first. The latter will be significantly slower. Q: Where do I write the details of the Pokemon I want? A: Write the details under Order Details at Checkout. Showdown Mode is preferred (if you’re using Smogon or Showdown sets, hit the Export button and paste that entire chunk to me). Alternatively, copy the “Advanced Mode” format shown in the Custom Pokemon listing description and fill it out to your liking, or do “Easy Mode” and write it however you like. Q: What are the default values of your Custom Pokemon? A: By default, the Pokemon is has Max IVs (6×31, aka 6IV). PPs are maxed. Pokemon are not Shiny unless specified by the customer. A: Effort Values, or EVs, are capped at 510 per Pokemon, and 252 per stat. An example EV Spread is “252 Atk / 252 Spe / 4 SpD”. There is no such thing as “Max Stats”, “Max EVs”, or “Perfect EVs”. You can read more about Effort Values at this article. A: The Shiny Charm, DNA Splicers, Prison Bottle, and Gracidea are Key Items. Z-Crystals only exist in your own game. They cannot be traded. A: Spliced Pokemon (and their items such as DNA Splicers) cannot be traded. These are Kyurem-Black, Kyurem-White, Necrozma-Dawn and Necrozma-Dusk. You would have to splice them together in your own game. For example, if you want Necrozma-Dawn, you’d need to order both Necrozma and Solgaleo (unless you want to splice it with one of your own). A: This is the preferred (and industry standard) format for Pokemon sets. Orders made with Showdown sets will be processed much faster. However – the format is extremely important (down to the spacing after the colons, capitalization). Extra notes (like Ball, OT) should come before or after the format, not in the middle. If IVs are meant to be 6IV, don’t even write the IV line. If the Pokemon is NOT Shiny, don’t even write the Shiny line (don’t even write “Shiny: No”). “Nasty Plot” is NOT the same as “Nasty plot”. “Yes” is NOT the same as “yes”. Capitals matter. (Gender) is optional. If there’s no preference, you can remove that. You can use the Pokemon Showdown Teambuilder to help craft your team in that format (New Team > Add Pokemon > Import/Export button after satisfied). A: Unlike previous Pokemon games, Let’s Go does not have Held Items or Effort Values. Movesets are also very limited – check the Serebii PokeDex to make sure the Pokemon can learn the move if you’re requesting any. All Pokemon from this listing will have maximum Awakening Values (AVs) at 200 in each stat by default. Q: Why is the Friend Code sent only after an order is placed? A: I have multiple consoles – 6 in fact. Customers are assigned the most appropriate console when the order is prepared and it doesn’t make sense to add multiple Friend Codes. Q: I’m a parent and my child wants me to buy him/her Pokemon! Can I do that? A: If you’re buying on behalf of a child, please make sure you understand all the trading instructions to guide your child along. Additionally, make sure you’re accompanying your child throughout the entirety of the process, so I can communicate with you immediately if there are any concerns. The Pokemon Daycare in-game may be more than willing to teach young Pokemon new tricks, but that’s not a service I offer. This website’s target audience is NOT children. A: I’d like to help trainers out there get their dream Pokemon quickly – but this takes time. I don’t earn much from this (PayPal takes 4.4%+$0.30 per transaction, those miscreants! Lump together your transactions if you can! ), and you’re actually paying for my time to get and trade the Pokemon rather than the Pokemon itself. A: Once payment is complete I generally don’t allow refunds unless I am unable to complete your order or if we are unable to establish a trade by my fault. If no contact is received from the buyer, I will also mark the order as complete once some time has passed (although the buyer is free to contact me after that to claim their Pokemon). I don’t accept returns unless the wrong Pokemon was sent. If I make a mistake with your order, you can let me know if you want a refund within two weeks. Please make sure your order details are as detailed as possible to prevent any miscommunication! Achievement Get! You’ve read the FAQ and qualify for 15% off your order of $15 or more with coupon code IHAZREAD15.